MOORESVILLE, N.C. — Zimbio Photo – Southeast NASCAR Whelen All-American Series racer Bryant Barnhill, who made his 2018 NASCAR Camping World Truck Series debut for Premium Motorsports recently at Gateway Motorsports Park, will be in-studio when tonight’s Motorsports Madness goes live at 7 p.m. Eastern on the Performance Motorsports Network and Spreaker. 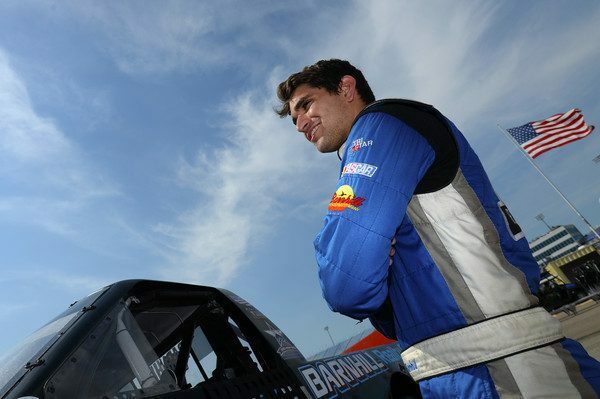 Barnhill, a popular 19-year-old racer from Conway, South Carolina, runs competitively with his late model stock car at the famed Myrtle Beach Speedway but his goal is to compete in a full season of NASCAR Camping World Truck Series races in 2019 provided plans fall into place. He has made two starts in the series thus far, one last season and one this season. Tonight’s show will also feature analysis of all four weekend events from Chicagoland including ARCA, NASCAR Camping World Truck, Xfinity, and Monster Energy Cup Series races. Hosts Jacob Seelman, Tom Baker, Steve Ovens, Chris Murdock and Cisco Scaramuzza will also debate the wild last lap finish between Kyle Busch and Kyle Larson, the performance of Dale Jr. and the NASCAR on NBC crew in their opening race broadcast of the season and the Mercedes meltdown at the Austrian Grand Prix which led to Max Verstappen’s improbable race win. REBROADCASTS: Motorsports Madness will be rebroadcast on the Performance Motorsports Network on Monday night at 8:30 p.m. Pacific, Tuesday mornings at 10 a.m. and 8 p.m. Eastern, Wednesdays at 8 a.m. and 10 p.m. Eastern, Thursdays at 1 p.m. Eastern and Fridays at 8 a.m. and 1 p.m. Eastern. ON-DEMAND: The shows will also be available on-demand via the Race Chaser Online Soundcloud channel on Tuesday afternoon following the show, or on iHeart Radio, iTunes, Spreaker and Google Play by searching ‘Race Chaser Radio’ on any of those platforms. Race Chaser Media is a full-service audio, video and written content creation company that specializes in, but is not limited to, the Motorsports industry. Race Chaser Media produces and hosts two weekly Motorsports podcasts that air live on their audio partner’s platform, the Performance Motorsports Network (PMN Radio). The podcasts are also rebroadcast on PMN Radio several times throughout each week and are available on-demand by searching ‘Race Chaser Radio’ on iHeart Radio, iTunes, Google Play, Stitcher, Tune-In, Soundcloud and Spreaker. Performance Motorsports Network (PMN Radio) is owned by Scorpion Radio Group, Inc. and is the official radio broadcast partner of Race Chaser Media. PMN Radio’s main studio is located inside the Race Chaser Media headquarters in Mooresville, North Carolina. A lineup of nine shows covering everything from Tractor Pulling to NASCAR, IndyCar, SCCA and much more makes PMN Radio your voice for Motorsports coverage at all levels. PMN Radio is also available on TuneIn, Aha Radio, iTunes and Google Play by searching “Performance Motorsports Network”.